This review contains MILD spoilers for the British (BBC/ITV) show. I started watching this series in July, BUT didn’t get to the bulk of the eps until Thanksgiving. 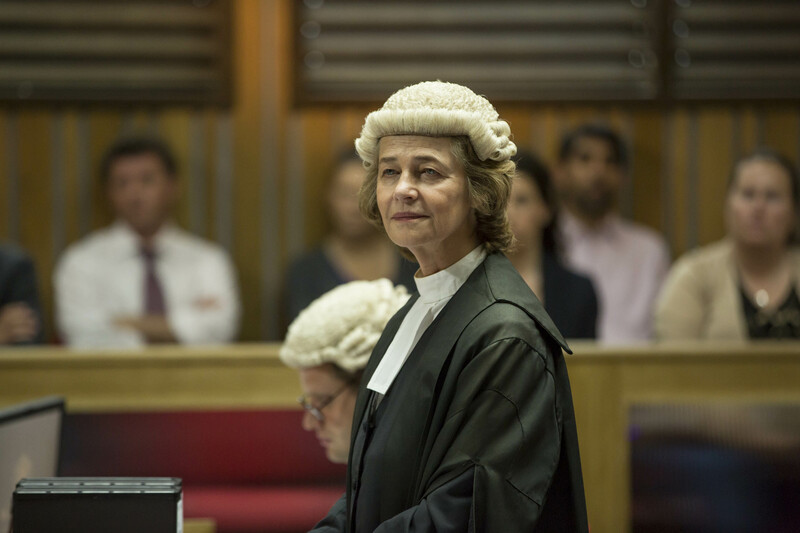 Series 2 focuses on the trial of Det. 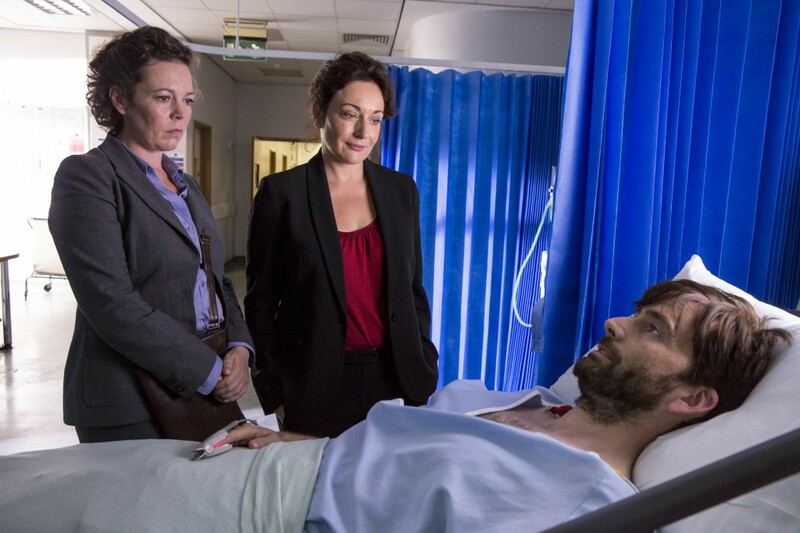 Ellie Miller’s (Olivia Colman) husband (Joe), an older case which is still affecting DI Alec Hardy (David Tennant), and how various individuals of the small town of Broadchurch (as well as a few new characters) deal w/ the aftermath of Series 1. The community is shocked (yet again) when Joe decides to plead “not guilty” to the death of Billy Latimer! 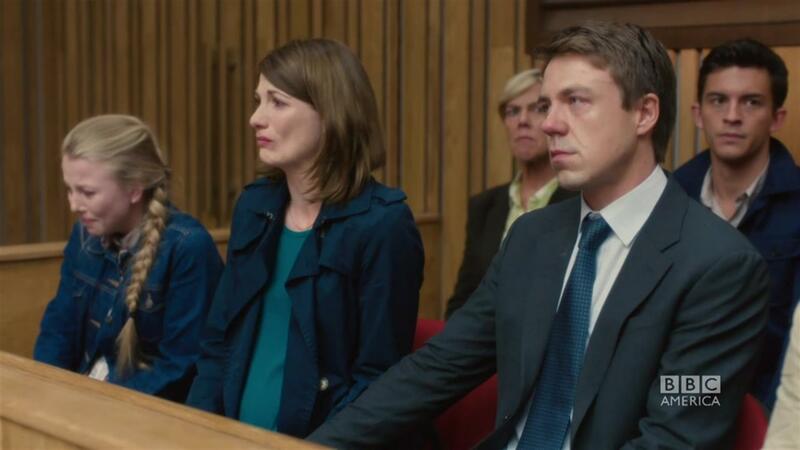 The Latimers, Beth (Jodie Whittaker) and Mark (Andrew Buchan), have a new baby girl; they still grieve for Billy. This couple has emotionally complicated chemistry with each other, perhaps even better than in the S1. (Their teen daughter, Chloe, doesn’t have much to do in this series.) Rev. Paul Coates (Arthur Darvill) and Australian hotel owner, Becca Fisher (Simone McAullay), are in a long-term relationship- BIT of a surprise. We can see that Paul is conflicted about his role in this town. Miller has been downgraded to the level of traffic cop and now lives in a small apt. w/ her toddler son, Fred. Her older son, Tommy (who was Billy’s best pal), has chosen to live temporarily w/ Aunt Lucy. Miller is STILL a dogged cop, even motivating Hardy to keep going when he gets disillusioned. We meet Hardy’s ex-wife and teen daughter, who live several hours away and are doing well in life. We sense that Hardy wants to be a more involved parent. He is now taking meds, BUT eventually undergoes a heart procedure. The BEST thing about this series is the growing friendship and continued partnership between Miller and Hardy! 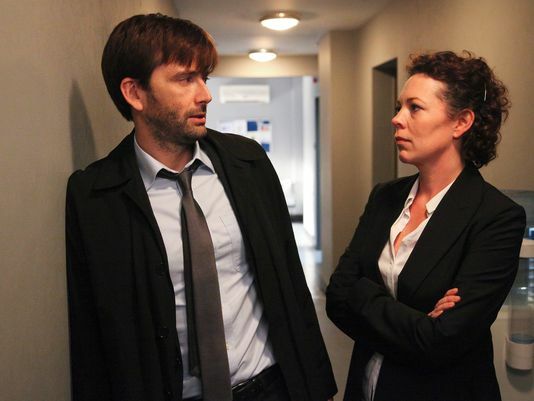 Colman and Tennant, at times, have a competitive (perhaps brother-sister) type of chemistry. 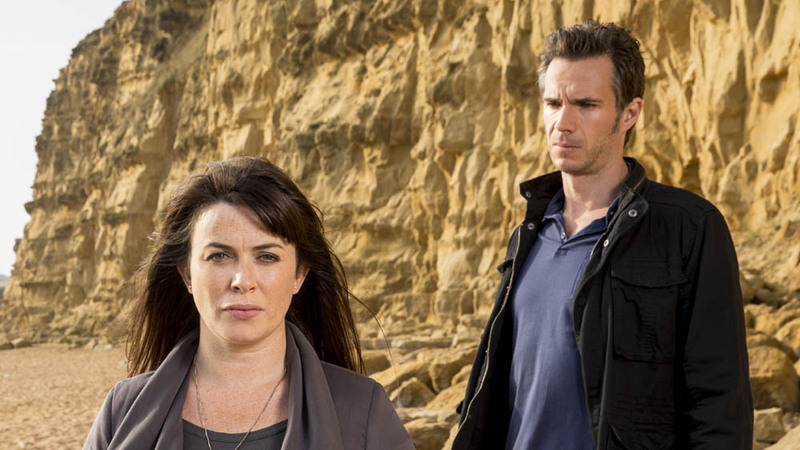 Pictured: EVE MYLES as Claire and JAMES DARCY as Lee Ashworth. This image is the copyright of ITV. We slowly learn more re: the Pippa Gillespie/Lisa Newberry case. 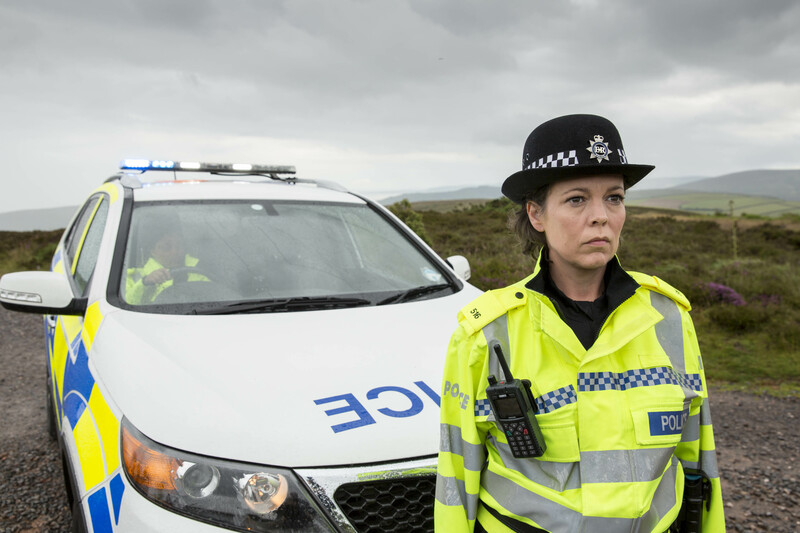 The witness Hardy had been protecting, hairdresser Claire Ripley (Eve Myles) and her overbearing boyfriend, Lee Ashworth (James D’Arcy from Agent Carter) feature prominently in this series. They seem like the definition of a co-dependent/dysfunctional couple; I would’ve liked to see less of their story. 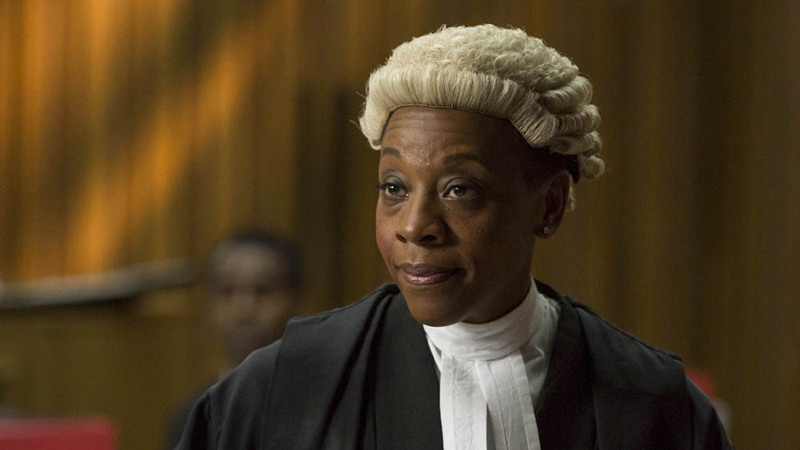 Pictured: MARIANNE JEAN BAPTISTE as Sharon Bishop. The newcomers to the series were the main draw for me (aside from Tennant and Colman). Two former colleagues, prosecutor Sharon Bishop (Marianne Jean- Baptiste) and veteran defense attorney, Jocelyn Knight (Charlotte Rampling) are on opposite sides of the trial. These women are BOTH very smart, tough, and experienced in court. They each have other issues to deal w/ outside of work, which we slowly discover. I wanted to see a BIT more of them! There is a LOT more to this show, so check it out if you liked Series 1.